Condition has valid from date but no end date. A condition ends when a follow up condition starts. For interests many conditions in parallel are possible. Therefore field Logical Group is introduced. One Logical Group contains interest condition and follow up conditions. Many Logical Groups in parallel are possible. Scaled condition contain many scales. One Scale define interest calculation for different nominal. Incremental calculation and interval calcualtion is possible. Scales can contain different variable interest rates, but all share same interest adjustment condition. 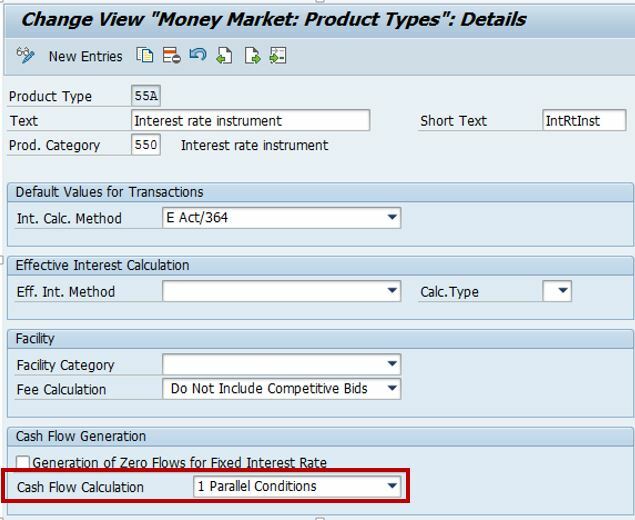 This condition is used if nominal changes with accrued interest calculation set should use own interest rate (and not interest rate from interest condition). All new functionality is part of business function FIN_TRM_MME. First this business function must be activated. Afterwards in customizing Treasury and Risk Management – Transaction Manager – Money Market – Transaction Management – Product Types – Define ProductType cash flow it is possible for Interest Rate Instrument and Current Account-Style Instrument to set cash flow calculation to Parallel Conditions. The functions can be activated with business function FIN_TRM_MME. Alternatively, you can follow the description in SAP Note 2232727. SAP recommends not using these SAP Notes , instead, directly implementing the Support package. In the “Conditions Details” screen, what is the relevance/significance of the “reference” under calculation base. The system presents 2 values, namely “0000” and “0100”?